de uitzending van PI4AA voort te zetten. 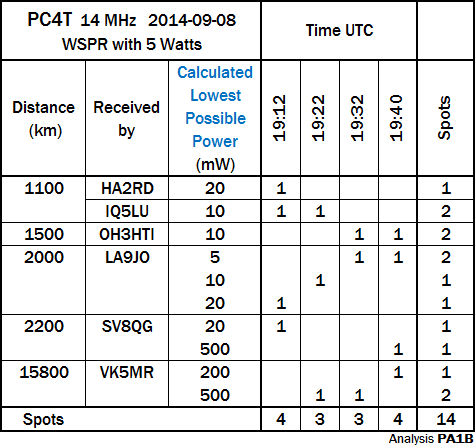 Many WSPR operators jump from one band to the next, when band conditions changes. Roger G3XBM ran his WSPR signal for several days on 28 MHz. 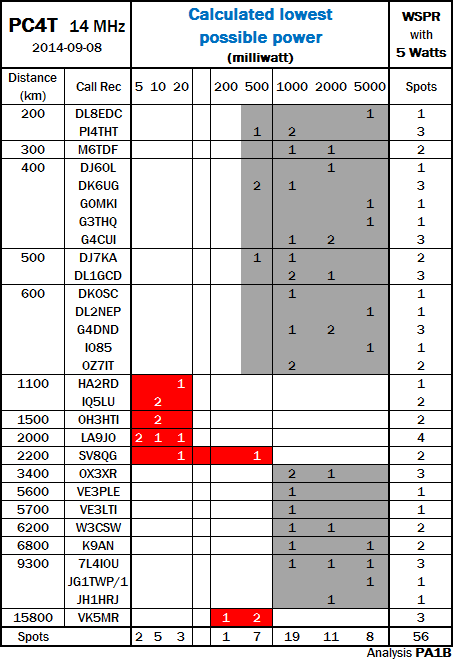 This provides interesting information on propagation on 28 MHz. I collected data from the WSPR database, to make this diagram. In this diagram, I choose to show the spots of Roger received by DK6UG over 600 kilometer and LB9YE over 1500 km. The diagram shows the number of spots for a day and from hour to hour. The stronger the signal, the lower the calculated lowest possible power. It's interesting to see that the propagation to DK6UG changes from day to day. On the 13th there are two peaks in the propagation, with no propagation in between. On the 14th there is only a spot on 18 UTC. This is at the same time of the peak of the day before. The 17th is the most interesting day. The day starts with reception on 11 till 12:58 UTC. The 17th shows one very strong spot at 14:10 UTC with a calculated lowest possible power of 10 mW. The next spot with a CLPP of 1000 mW was on 14:54 UTC. Notice that in this spot the signal strenght is 20 dB lower. Please notice that there is no reception from 13:00 till 13:58 UTC on all days,except for the 19th. 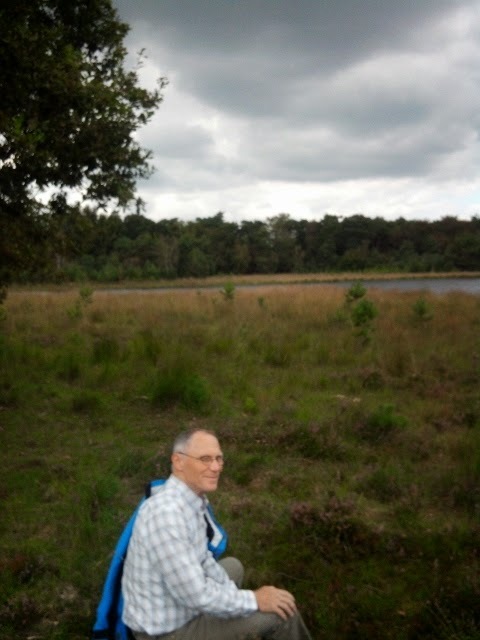 At the 13th the propagation is good to DK6UG, but not to LB9YE. At the 14th it's the other way around. David DL1DN has send me a link for his very interesting video. He reduces his power using an attenuator of 3 dB and 3 attenuators of 6 dB. An attenuator of 3 dB reduces the power to 1/2. An attenuator of 6 dB reduces the power to 1/4. David starts with 2.5 watt (0 dB) and uses a homebrew multiband dipole at 1.9 m above the ground. 2:00 -15 dB 80 mW Video says: -18 dB, but it is -15 dB. Please notice that every step of 6 dB is 1 S-point. The receiving OM has an calibrated S-meter, which is excellent for this experiment. The video shows what happens when the power is reduced. David transmits but also receives through the attenuator. Every time that David reduces the power, also the signal of the received station is reduced, so you can hear for yourself what each step of 6 dB does. As you can hear, listening though the attenuator is absolutely NO problem. 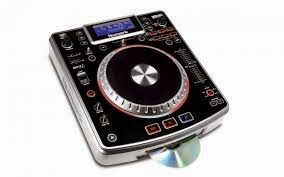 De NDX800 is een hoogwaardige controller voor de DJ met meerdere muziekbronnen. U kunt alles mixen met de NDX800. Het maakt niet uit of de muziek op uw computer, USB stick of CD staat! Dit digitale deck heeft het 'gevoel' en de indeling die u gewend bent. Natuurlijk wel met een beetje Numark-innovatie! De NDX800 is echt een prachtig apparaat. Zo ook bij beide apparaten van Sebastiaan, DJ SeppieJ. Pijl bij de defecte START schakelaar, Demontage, STARTschakelaar verwijderd en Wachten op de nieuwe schakelaars. Chef monteur Wendy heeft de apparaten open geschroefd, nadat ze op internet een video voor het vervangen van de schakelaars had gevonden en pa(1B) heeft de schakelaars vervangen. Niets is zo erg als een haperende schakelaar. Ik heb sinds lange tijd de soldeerbout weer eens opgestookt. En een zeer tevreden Sebas, mixt weer als vanouds. hi. A simple way to reduce the power of your QRP set to milliwatt level, without modifying the set, is the use of attenuators. The combination of 20 dB, 10 dB, 7 dB and 3 dB is fast to switch, when you want to increase your power in QSO's. In one move, one attenuator section is switched OFF and an other is switched ON, to increase the power with a step of 3 db or 4 dB. PA1B Fast and accurate 40 dB Power Attenuators for QSO's. Specially designed to use in QSO's with very low power. In addition to the update of the post of 2014-09-08, I made a new analysis of the spots between made over a distance 1500 km to 2200 km. The spots were made during the morning. Gisteren hebben mijn vrouw en ik eerst geklust. Daarna zijn we doorgereden naar het Leersumse veld. Vanaf een bankje hebben we de schaapsherder en zijn kudde gadegeslagen. We zijn doorgelopen tot het meer en hebben daar heerlijk in de zon gezeten. Ik heb genoten van de mooie kleuren groen van de bomen. Dit is een van mijn favoriete plekken. Toen we terug liepen kwamen we nog drie koeien tegen, die ons luid loeiend begroetten. Ter afsluiting hebben we een heerlijk kopje koffie genomen bij La Place in Maarsbergen. We hebben genoten van deze mooie nazomerdag. 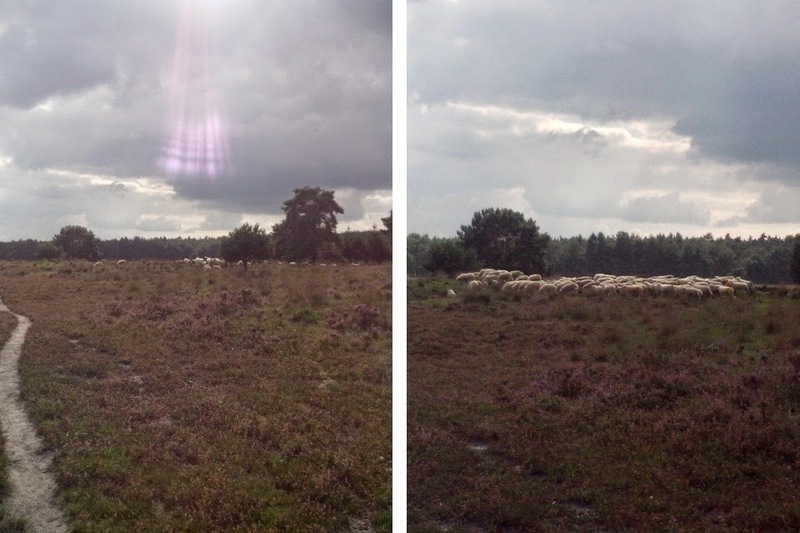 Mijn vrouw heeft nog twee foto's van de schaapskudde gemaakt. 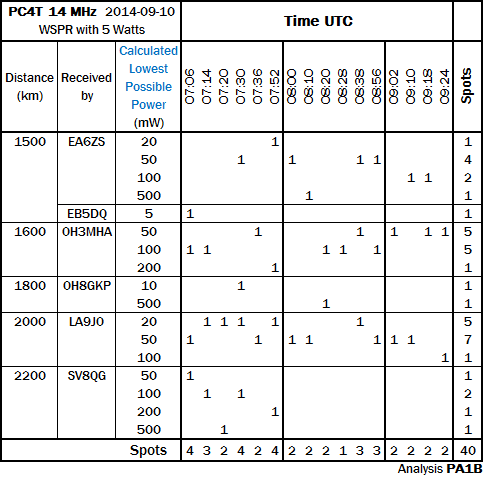 Here is a WSPR Propagation Analysis of spots of Paul PC4T on 14 MHz. The lower the Calculated lowest possible power, the better the propagation. 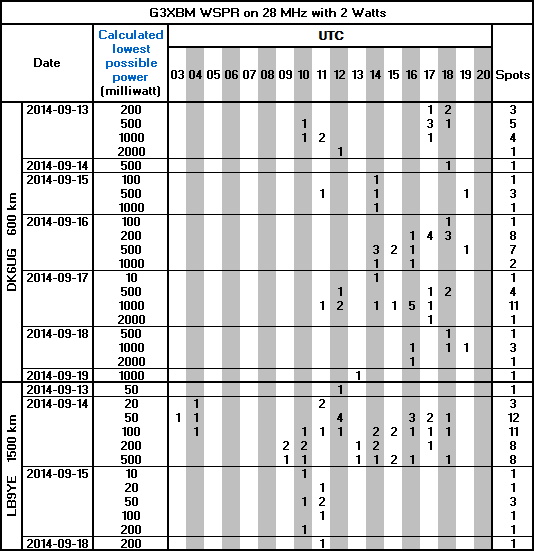 Nearly all spots over 1100 to 2200 kilometer could have been made with 20 milliwatts. I made an extra analysis of the spots in the red fields. The lower the Calculated Lowest Possible Power, the better is the propagation. The signal strength increases with 6 dB (in power 4x as strong) from 19:12 till 19:40 utc. The last spot is 14 dB weaker than the first. The last spot is slightly stornger than the other two.